No need to tell you I've been busy and still grieving unexpectedly when alone, so I just couldn't write. But so much is happening in fashion exhibits that I must send this brief note. Until June 5, Pulp Fashion: The Art of Isabelle de Borchgrave is on exhibit at the Legion of Honor Museum, San Francisco. If you go to www.amazon.com you will find several books by de Borchgrave and others. 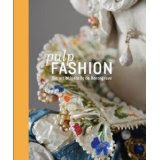 I have ordered the book Pulp Fashion: The Art of Isabelle de Borchgrave by Jill D'Alessandro and was hoping to review it for you. But it hasn't arrived yet. There is one review that indicates it's a good book. Until July 4, Balenciaga and Spain is on exhibit at the de Young Museum, San Francisco. This exhibit is curated by Hamish Bowles, European editor-at-large of Vogue magazine, featuring nearly 120 haute couture garments, hats, and headdresses designed by Cristóbal Balenciaga (1895–1972). www.examiner.com/fashion-in-oakland/field-trip-balenciaga-and-spain-exhibition-at-the-de-young-museum This is another show not to be missed, even if I have to walk to get there! An opening day symposium included speakers Hamish Bowles, Pamela Goblin, Miren Arzalluz, and Lourdes Font. I wasn't able to go, but all is not lost. The conference was filmed for on-demand viewing. Pay $9.95 USD and you can watch the symposium for the duration of the de Young exhibition which ends on July 4. I watched the preview and wish I could have the whole thing on DVD! This is almost four hours of watching time but that's why you want to be able to go back again and again. Wonderful stuff! John Marshall Has A Blog! I get so much pleasure from Priscilla's blog (http://priscillakibbee.blogspot.com) but also just as much from her friends' links. These two recorded recent events. At one Priscilla was helping/teaching one of her students, and the other records a recent Priscilla fashion show. Enjoy! My wish is to offer you a gathering place for the wearable art and artwear communities. We can talk, we can show our work, and I hope we can support each other as we share. Please send me photos of your garments so we can all see what you've done. I'm doing the same as I get them made. Share news too please! Seen any great wearables lately? In 1997 I had begun a mailed newsletter, Art You Wear. This blog is a way for me to rebuild what came before. I am sewing more than ever, looking forward to less fear of failure and fear of what others think, and finding new creative heights. I'll still talk about the best patterns and books for wearable art. To write to me via email, Google on Rosalie Cooke. Find my review of Bonnie McCaffrey's book and there for all the world to see is my email address. A bit disconcerting but what can you do--it's been there for ages. You can also reach me on Facebook. What do I know about wearable art? Never enough, but I copyedited quilting and sewing books for Robbie Fanning and Chilton Books, worked with Kenneth D. King and Linda Lee on the books for the Vogue/Butterick tv series, and even judged the Bernina Fashion show two times. I also edited an unpublished book for wearable art written by 5 wonderful Fairfield designers. We're still trying to get it to a printer!